Captain Beefheart’s acclaimed 1969 double album Trout Mask Replica isn’t as good as some might think. Regardless of it being ahead of its time and purposely pushing the limits of traditional music, the album is mostly unlistenable and you may not even be able to finish it. Similar to what the Velvet Underground was recording on White Light/White Heat in 1968 with noise rock and what the Beach Boys were doing with their trilogy of lo-fi albums in the late sixties, Captain Beefheart, aka Don Van Vliet, was laying down the works for experimental music, art rock and even shock rock that would crossover into the post-punk and new wave styles a decade later. Before music oddities like the Residents, Tom Waits, Death Grips and Macula Dog, there was Captain Beefheart and His Magic Band. Trout Mask Replica is highly praised by a certain part of the music community and is considered to be a groundbreaking avant-rock masterpiece that has appeared on many greatest of all time lists. It was even inducted into the Library of Congress’s National Recording Registry in 2011. In the July 26, 1969 issue of Rolling Stone, legendary rock critic Lester Bangs called Trout Mask Replica “the most unusual and challenging musical experience you’ll have this year .” Trout Mask Replica went onto influence countless creative figures from Matt Groening to the White Stripes and still continues to influence to this day. The near-80 minute album is tremendously imaginative and wild, which may feel like this big joke that has never been told. It takes many listens to get through the unlistenable, but alluring imagery and rampage of styles, including sloppy garage rock, rambling spoken word, freestyle jazz, R&B and shaky blues. Though you wouldn’t realize it unless you read it somewhere, but the clash of musical styles, including the layering of polytonals, bizarre time signatures and improvisation were well-rehearsed before recording, which makes “Trout Mask Replica” one of the most puzzling and challenging recordings of the 20th century. In a span of two years, Beefheart and a few members of his later Magic Band went from sharp dressed ego-driven hippies playing blues rock to a surreal musical cult. Beefheart’s more creative psychedelic blues rock albums, Safe as Milk in 1967 and Strictly Personal in 1968, hinted out Beefheart’s future vision to his music. Beefheart’s inspiration came from his old high school friend Frank Zappa and what he was doing with the Mothers of Invention at the time. When Beefheart and his band were dropped by their former label, Beefheart’s old friend was able to lend a hand. In the late sixties, Zappa started a pair of record labels called Bizarre and Straight Records. 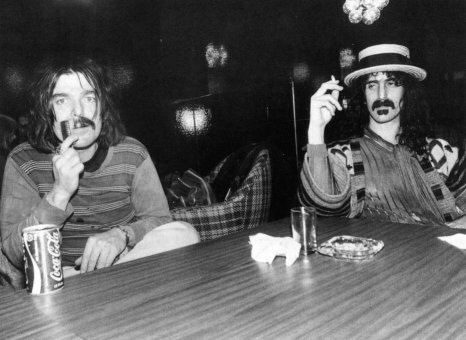 Zappa offered Beefheart a chance to record an album through Straight Records, which was a subordinate of Warner Bros., with complete artistic freedom. This was clearly evident on Beefheart’s magnum opus “Trout Mask Replica” with Zappa serving as producer. Before the recording and production of Trout Mask Replica Beefheart, who was not a trained musician, composed every song on a piano that he was oblivious with. Of course Beefheart has played many instruments like the tenor and soprano saxophone and of course the harmonica, but Beefheart was really just good at making noise, which is why Trout Mask Replica sounds mostly comprised of improvisation. After composing the songs, Beefheart’s Magic Band that consisted of Antennae Jimmy Semens, Zoot Horn Rollo, Rockette Morton, John French aka “Drumbo” and Victor “The Mascara Snake” Hayden (Beefheart’s cousin) translated Beefheart’s work into a mind-blowing and tangled blues inspired rock album that was a new sound to the ears. 50 years later, the starvation and Beefheart’s dictatorship had to of been worth it. Beefheart snarls and howls fuzz on the opening track “Frownland” over a disorderly arrangement of guitar hooks that are the epitome of anti-music. At the beginning of the track, it sounds like you’re about to hear a classic riff that is reminiscent of the Beatles’ “Taxman” or the Kinks’ “You Really Got Me.” However, around 14 seconds into the song, everything becomes flustered and the insanity begins. One of my personal favorites “Dachau Blues” echoes the madness that would be embarked on Devo’s “Too Much Paranoias” nine years later. Tracks like “Dachau Blues” and “Wild Life” rapidly stand out because they immediately come after the a capella spoken word tracks above. With an arrangement like this, “Trout Mask Replica” is like a special event and you don’t know what to expect next. The gushing “Ella Guru” sounds like Beefheart and his band having a jam session while taking a bath with the quirky dust bunnies from “The Big Comfy Couch” fantasizing about a gorgeous woman. “Moonlight on Vermont” is one of the many fan-favorites off Trout Mask Replica. Not only is it trembly, but it’s assertive all around. This type of aggressiveness comes in every once and a while on Trout Mask Replica, especially on the later track “Neon Meate Dream of a Octafish.” After Beefheart’s wandering and puzzling poetry on “Pachuco Cadaver,” the song maintains a driving riff that seems drifting at times, but remains stable for the listener to indulge in. Beefheart’s multi-octave and troll-esque vocals come alive on “Bills Corpse,” which is one of the more startling tracks with lyrics just as chaotic as the battling guitars. Lyrics like “Oh, her ragged hair was shinin’ red white and blue / All-and-all the children screamin’ / Why, surely madam you must be dreamin’ / You couldn’t have done this if you knew what you were doin'” suggests “Bills Corpse” is about a polarized United States especially at the time this was written, amongst various races and political parties as our Lady Liberty looks on in misery. Or simply it’s about a dead goldfish named Bill. Either way, Beefheart’s writing is always ambiguous, which makes the listening experience a whole lot better. The beginning of “Sweet Sweet Bulbs” sounds like a mockery to the Beatles’ “Wait” that starts off with something bright like in “Frownland,” then is utterly destroyed. “China Pig” and “My Human Gets Me Blues” are the more normal straight forward blues inspired tracks off Trout Mask Replica “China Pig” instantly sounds listenable with its cliché Bo Diddley lick merged with Beefheart’s lo-fi vocals. However, the lyrics imply a story that a farmer who raised a pig had to butcher it and feed it to his neighborhood. Some listeners may find it disturbing and sad, since the butcher regrets it repeatedly declaring how he doesn’t want to kill his China pig. The lyrics could’ve drove inspiration from The Great Depression-era where some people were forced to eat their pets. Then there is a good flow of instrumentals, which serves sort of as an intermission for the idiosyncrasy depicted in the first half of the album.”Dali’s Car” is greatly misty like it could’ve served as a silent film score from the 1920s. It transitions into the thrilling second part of “Hair Pie: Bake 1,” with a catchy melody that is perfect for a pair of dancing skeletons. Antennae Jimmy Semens obnoxiously screams lead vocals on “Pena” with Beefheart, Zappa and the rest of the Magic Band idiotically screaming in the background. Pena” begins with a cryptic exchange between Beefheart, his cousin “The Mascara Snake” and Zappa in the studio. Not only does the dialogue sound like two actors practicing reading their lines for a corny sci-fi horror film of the 1950s, but it mentions the strangest line from the album: “Fast and bulbous.” The absurd words came up before during the beginning of “Pachuco Cadaver.” It’s hard to truly understand the meaning of these words, but when listening to the entire album repeatedly, you tend to understand the words as nothing but being obscure and nonsensical, which are perfect words to describe the ethos of this album. “The Blimp (mousetrapreplica)” is intense like an action scene in a classic spy movie, but when Semens steps in again at lead vocals, it’s like you’re hearing a deleted scene from a John Waters film. However, as soon as Zappa asks “You Ready?” to Semens in the intro, you can feel the rain before the flood. With Semens annoyingly panicking on a phone, “The Blimp (mousetrapreplica)” hilariously mocks the broadcast of the Hindenburg disaster. As Zappa and Beefheart admire the audio, you get one more whirl of the drums as they creep in to close the distasteful and freakish piece. Beefheart’s intimidating and deep voice sounds similar to the snarkiness of Zappa’s over the smoothly melodic guitar driven “Old Fart at Play,” which mentions an old fart (Captain Beefheart) wearing a wooden fishhead like Beefheart is shown wearing a carp’s head on the cover of the album, blasting language in a voyeuristic manner. This unique fantastical musical voyage comes to an end with “Veterans Day Poppy,” which is an underrated anti-war gem. The first half bonded with some frantic math rock elements, deals with the narrator being reminded about the death of his son, who was killed during the first World War. The second half serves as the narrator’s memories of burying his son over traditionally despairing instrumentals with a melancholic tone that resonates, but contrasts the entire tone of the album. It’s hilarious that not only were stoners losing their minds to this album in 1969, but 50 years later, there are now people consciously regarding it as one of the greatest albums of all time. It used to be argued that you can only listen to this album while stoned, but now it’s been rumored that you have to have a very high IQ to fully understand the “genius” demonstrated on Trout Mask Replica. In the end, it may sound like one long terrible repetitive song, but remember this was 1969. Who was making music like this besides Zappa? In many ways this album is pure garbage, but in other ways it’s an innovative masterpiece. I think we would still have great artists like Talking Heads and the Red Hot Chili Peppers if this album was never recorded. However, you cannot deny the enigmatic influence Trout Mask Replica has brought to our culture. Ehh – Nothing, it will all grow on you. Listen to Captain Beefheart’s Trout Mask Replica here and see if it’s worth it.